An experienced Boat Transporter is valuable. Professional, reputable Boat Transport Companies or Boat Movers must be licensed by the state in which they operate. They must also have well maintained and up to date equipment in order to pass DOT inspections. Well trained drivers that know whether they can accommodate your vessel is a must. 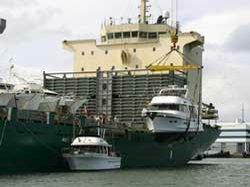 Boat transporters should be experienced in moving your type of boat and know its particulars. The Boat Transport Company must be provided accurate information regarding your boats loading and unloading locations, specs and dimensions in order to provide you with an accurate quote and safe and timely transport. Powerboats, Sailboats and Yachts can require different equipment for transport and your transport company and the driver need to know how to prepare for your vessels transport. "Working with a boat transportation services company on the Internet can be nerve wracking. You never know what kind of an operation you are really dealing with. I purchased a boat on the east coast and needed it moved quickly to the west coast. Despite a nest of challenging problems, holiday season, bad weather, an unusually heavy tongue weight and a questionable brake system, Boat Transport Pros got her here in great shape. I received boat shipping cost some of which were too low to be legit. Beware of low bidders. You get what you pay for. The Boat Transport Pros quote was about in the middle of the legitimate bids and there were no “surprises” when she arrived. I’ll recommend them to anyone needing boat transportation services." 1. Refuse a load deemed to be unsafe for any reason and report their findings to the company manager who in turn will communicate any issues to you. They will also check preparations completed to make your boat safe for transport in advance. 2. Ask questions of the pickup and delivery locations on its facilities and surroundings for potential obstacles for getting in and out of boat yards and marinas. 3. Load your boat in a safe manner ensuring that it is road ready. This is very important as half the work involved for Boat Movers is readying the boat for transport and getting it loaded properly. 4. An innate understanding that larger and wider boats, as yachts need have specific requirements when being made ready for Transporting. For example, when shipping a yacht, having the proper escorts and height poles in those states requiring them as well escorts that may be required. 5. The boat trailer chosen for the move is of the correct weight load and of proper design to haul the boat properly and safely. 6. Drivers will inspect and record your boats condition, make notes of its equipment that can be seen, basic inspection of its hull as well as the trailer if applicable. Every professional Boat Transporter has a check list to carefully go over and complete before departing from pick-up and delivery. 1. Straps and chains coming loose. 2. Items on your boat that may become loose and may need securing. 3. Equipment maintenance, tires, brakes etc. on trailers. 4. Road conditions, weather and traffic. Strong winds, major rain events, earthquakes and other known “Acts of God” are not considered to be the responsibility of the company. Unexpected road repair or construction may cause delays. If you and your Boat transport services professionals discuss these conditions in advance it may save you time and stress. After providing information on your vessel, loading and unloading, you should address the schedule to move your boat. However, the scheduling should not be the most important thing to consider! Finding a Boat Transport Company that is familiar with your boat and experienced in the route and logistics of your particular move is the most important issue. Once you have found a boat transporter that you feel comfortable with and are satisfied will meet your expectations a transport agreement will be issued to you for read, sign and return to the transporter. The contract will outline all the details of your boat and where it is picked up at and delivered. It will also outline the dimensions of your boat. Be accurate here as the accuracy of the quote will depend on it. It will also outline a targeted schedule. The costs involved will also be outlined and when and how they should be paid. Boat Transport Companies usually require an initial payment prior to pick-up. This ensures you a place on their schedule and assist them in obtaining permits and escorts if required. The initial payment finalizes the agreement and gets your boat on the schedule. The day the truck arrives the vessel should already be prepped and ready for loading. Boat Transport Pros has some terrific Boat Preparation Guides for your use yet feel free to ask any question or address any concerns with them directly. You may find these guides at Boat Transport, Sailboat Transport, Yacht Transport, Powerboat Transport, International Shipping and Small Boat Transport. Your driver will inspect the boat and work with the marina to get the boat loaded. Before loading the boat it will be inspected for any damage that may have happened prior to his arrival. Notes will be taken and you will be aware of any damage that is noted. If the boat dimensions are in question the driver will then measure the boat to determine its dimensions. Permits should have already been obtained based on accurate specs. This is why it is important to have accurate dimensions in advance. Permits are based on the overall size of the boat after it is loaded. Once the boat is loaded it will then begin its journey. Your driver or boat transporters should contact you once the vessel is loaded and should stay in touch as to their progress. En route, the boat transports will be inspected to ensure it is traveling well and safely. Unexpected encounters such as weather, road construction and traffic will affect the delivery time. Your driver must keep you updated to any of these occurrences that will alter the schedule. Delivery day, your boat is home! You or an agent acting for you should be at the delivery location to accept the boat and pay any outstanding balance. When the boat transporters get there they should have already contacted the marina for an unloading time. Prior to unloading, the Boat Movers will do an inspection, either in your presence or with the yard personnel. This is to ensure that no damage has occurred to your vessel during the transport. Your professional boat transporter will ask you or your agent accepting the vessel to sign the Bill of Lading and provide you a copy of it. On the question of if tips are expected or necessary: Our thought on this is, if you are satisfied with the job done, a tip is in order. An amount to cover a good dinner in your area for the driver is usually more than enough. It goes a long way in saying thank you for a job well done and I am happy you made the effort to Transport my Boat in a safe manner! Boat Transport Pros always strives to provide the best in boat transports along with the best value in boat shipping cost.